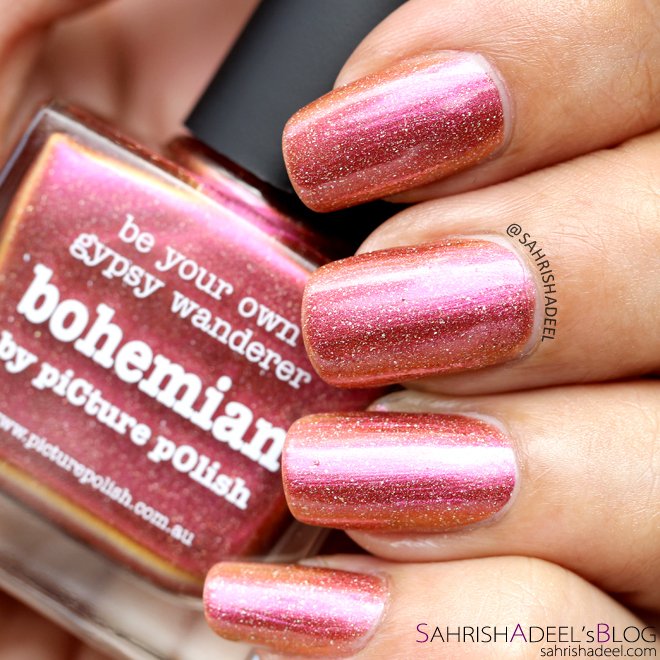 Bohemian by Picture Polish - Review & Swatch | Sahrish Adeel - Malaysia based Pakistani Beauty & Lifestyle Blogger! It has been almost two years since I published any nail polish reviews on my blog and I honestly feel bad about it. Hence, I promise myself to try and publish atleast one nail polish review every week. Today, as a fresh start to such posts, I have Bohemian by Picture Polish. Check out the full post for swatch & some macro shots of this beauty. Bohemian is a gorgeous shade with a versatile personality. It is a stunning combination of pink & bronze-y/orange-ish shade with silver specks as you can see in the macro shot and also on the nails. It comes with a nice applicator brush with firm grip and I am telling you, PP bottles have one of the best applicators for polish application with precision. It comes in a transparent glass bottle and contains 11ml of product. I am not at all into orange shades, to be very honest and I must tell you that I was a bit skeptical when I saw the bottle and even first coat could not impress me. But after the second coat, when the polish became opaque, I was mesmerized by the final result. The silver & pink in the shade toned down the orange-ness for me and it looked even more pretty in the sunlight. I absolutely love how it shifts color when I move my nails. This polish goes opaque in two slightly thicker coats or three thin coats. I prefer thin coats since I feel like it improves the wearing time of the polish. Longevity is just as usual; stayed on my nails for good 6+ days without chipping and I tried it without any base / top coats. Overall, I could not be happier to have this baby in my collection and since it is not a limited edition polish, it is even more precious for me. If you are already using PP, then you know how great they are but if you don't own any, at least try one. I promise you will fall in love. 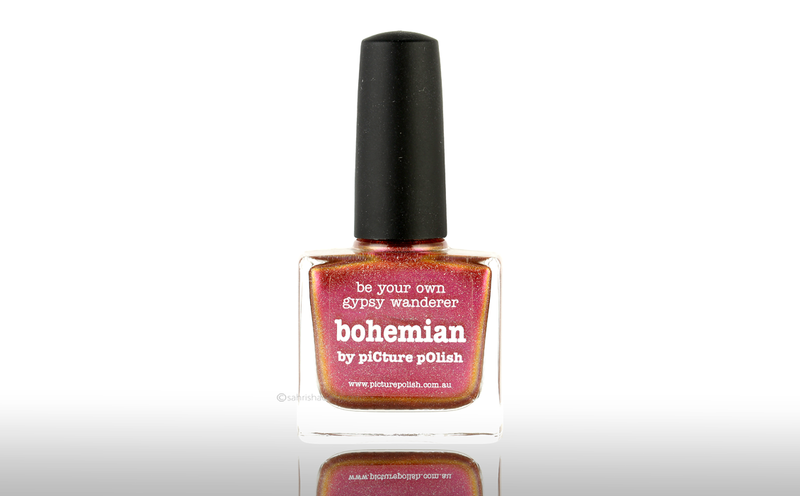 Bohemian is retailed for AU$13.00 and can be purchased online from piCture pOlish's website. They ship worldwide and have great daily deals. You can also buy their nail polishes via their network members all over the world which will save you a fortune on shipping.